The Rubik’s cube was sitting on the table undone. The ability of solving apparently unfathomable situations was since always of supreme interest to people of certain perspicacity. As the artist rejoices from a complete – and well refined – piece d’art, the inquisitive mind is easily amused by the results of the intricate workings of reason. Tasks such as playing chess, deriving algorithms, solving puzzles, discerning enigmas, and ultimately playing an instrument are the utter entertainment of a searching mind. These analytical individuals are easily satisfied through reading, music, and study, but most of all; through human relations and demeanour. Understanding the human mind through individuals’ behaviours thus represents the culminating fascination for people of certain acumen. If analysing a person’s mind is really like playing an instrument, then the best concert pianist should take into consideration multiple factors when performing; technical difficulties, such as arduous fingerings, emotive perceptions, dynamical interpretations, and adequate pathos. Although the notes are written black on white on the music score, the average musician will be greatly troubled in reading, and eventually performing it. Most of the times we are confronted with evident facts; however it takes exercise and a certain amount of talent in order to fully interpret the significance of the situation taken into consideration. My intent is not to write a treatise, but to introduce the reader in the world of analytical procession, in order to be fully acquainted with the topics which will be discussed. In a pleasant English afternoon of 1978, I was invited to one of the Rotarian Club’s delightful evenings. I was surrounded by the most interesting and sophisticated individuals. However, my mind was busy on another thought - The Rubik’s cube was still sitting undone on the table. 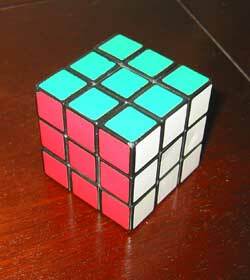 Eventually I became too much baffled to simply stare at it without being able to actually attempting to solve it. I looked around, and hoped that no one was watching –I wanted the cube all for myself. I stood up and walked towards it, thoughtfully picked it up in my hands, and walked back to my chair. After sitting down and searching for a definite colour pattern in the cube, I started moving the sections of squares prudently. ‘Ah, no my dear Sir, in such a manner you are only making the colour pattern less discernable! Although it apparently seems that you are grouping all the greens on the superior side of the cube, you are actually making your task a more arduous one’. ‘Thank you sir. We well know that the cube is all here and tangible; there are neither hidden squares nor invisible tricks. There are formulas, easily memorised in order to solve this enigma. Assuming that the upper side is U, and the front is… oh pardon me sir. I forgot to introduce myself! I am Guglielmo’. ‘Guglielmo is just my first name. I am Guglielmo Manni. Feel free to call me as you prefer’. ‘Mr Clarkson’ I promptly answered. ‘Yes Mr Clarkson, your examination of my physical features as a reaction upon hearing a name of unknown roots, was clearly a hint for me that you knew so few about me, yet wanted to know much more. You then looked over the Spanish flag on the other side of the salon and lingered on it until you turned your glance to the adjacent Greek flag with a disoriented look on your face. After finally focusing on the Italian flag, an idea suddenly came to your mind. You could solve your doubts by looking at my style. My shoes, as you might have noticed, are of the finest Italian leather. You then focused on my suit design, and yes, it is of Italian manufacture. However this was not enough and you started looking for my Rotarian Club admission card. I have it in my wallet Mr. Clarkson’. ‘I looked at you several times in the face, and all the times, you were working on the cube. How did you…’. ‘Yes Clarkson, here’s your cube’. ‘Ah yes my friend, as I was telling you before, it is not difficult at all. It’s like playing the piano. All you need is concentration, patience, exercise, and a discrete quantity of talent. As I mentioned before, supposing that U is the Upper side, F the Front third, L the left third, R the right third, B the rear third, and D the bottom third. In order to solve it, you must remember that you must form an isosceles triangle using vectors and you will obtain the following formula’. ‘Remember that the subscripts stand for the turns. A 2 means that you turn two times clockwise, and the L and R mean that you turn once left or right, accordingly. I could not solve the Rubik’s cube. Perhaps it takes some sort of genius as Mr. Manni to do it. After that, he handed the paper with the formulas to me, and I put it in my wallet. We passed the rest of the evening pleasantly discussing about various matters. He told me that he was in London just for research at his Università, and that he will be returning to Rome within a few months. He was currently looking for an apartment to stay in, since he was still living in the campus sponsored residence. Speaking about Universitàs and colleges, I have not yet told the reader that I have just earned a degree in law at the University of Oxford. Still looking for a job while earning my master, I dedicated my life to the pleasure of utilizing my family’s money for relatively futile concerns. I fancy enjoying life as it comes to us – and money gives the perfect opportunity of successfully carrying out such a delightful task. My opinion (with which my dear friend has never agreed) is that money can go as far as your eyes can; therefore if you can see it – you can buy it. And to be honest, money was not something I lacked of. Probably it was the only thing I had plenty of. I dedicated myself, as Guyllermo would later say, to Bella Vita. We thus moved together in one of the most exclusive flats in London. I took care of the rent, and my friend administered everything else which did not concern dirty sterlings. This remarkable man knew more than anyone would judge from his candid appearance. Although he was a charming young man, to my great surprise, he did not take much interest into women. His thoughts were dedicated to less common matters, and peculiar notions. With this being the situation, when my friend had to return to his home country in the summer of 1978, I decided to go with him. I once had visited Rome with my parents when I was very young, and since always tried to return there, but I simply never had the occasion. I requested in advance to my university faculty a semester abroad, Rome to be exact. As soon as we got in Rome, Mr. Manni brought me to visit the main Roman monuments in museums and Piazzas. On the eighth day of my residence there, we visited the Vatican. How indeed a beautiful place! I was able to visit the Vatican libraries and museums due to my friend’s Università card. What a fantastic city, with the most exclusive history (And with Bancomat instructions in Latin!). Mr. Manni then explained to me that the Popes’ temporal power was perhaps even greater than the spiritual power they exerted. As a proof of his patriotism, Manni then told me that these powerful leaders had been for more than 250 years, native Italians. ‘You see my friend; Italy is an elegant mixture of Catholicism and foreign policies. 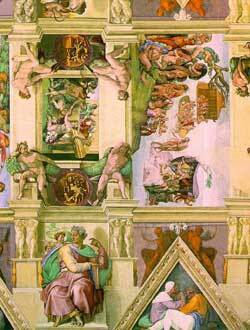 Popes are the utter figure of spiritual leaders, but excel –history is our witness – in governing a country. They have been doing it for centuries. They paradoxically have more power than the President of the Republic itself. ‘Their means of communications are the most broad you could ever imagine. They communicate to fedeli in various manners. Throughout the last centuries, popes have published hundreds of encyclical letters, books and documents. Now that our means have expanded, the Church has expanded by consequence. Television for instance is slowly becoming a favourite mean of communication in everyday life. What special news could there be to interrupt a radio program so suddenly? Did someone ruin the Vatican monuments? Was there a theft in the museum? Was there a murderer wandering in the Vatican? Was the Pope dead? I came up with all kinds of hypotheses, but discarded the last one mentioned. Pope Paul VI was still relatively young. While the Italian operator was disclosing the event, my friend gravely listened. The radio operator’s tone gradually softened, when his voice began to lightly quaver. After a few minutes the announcement was over and the radio did not transmit any music. He did not answer, and as a matter of fact I doubt he had even heard me. When I was about to ask it again, I noticed some black smoke floating in the air. What an unusual sight it was. I then looked better to figure out. There was black smoke over the Sistine. What did that mean? My doubts were becoming suddenly impendent and my fears appeared to be augmented by each second passing by. By now I was used to Manni’s peculiar requests, which circumstances make even more unique. Sensing that he was in a hurry, I took out the money from my wallet and gave it to him. Centomila lire would be the equivalent of 35 sterling pounds. He took it and ran into the Basilica. The death bells were still to be heard. What did Manni have in mind? And why did he want my money? These are questions that I still can’t perfectly answer myself although these events that I’m recounting took place more than five years ago. Mr. Manni soon became an invisible spot running towards the Basilica. I was now in the wonderful Saint Peter Square, with the most breathtaking sculpture and history. No matter the pulchritude of my surroundings, I had a feeling of uneasiness. Was the pope dead? Will the people come to the Piazza? Where could I ask information? I did not know enough Italian to carry on a conversation with a native speaker. I was worried for my friend and myself. I thus looked for a place where English was spoken. I headed towards the train station. She was still looking at me as if expecting an answer, or some further information by me. I embarrassedly showed her my wrist watch, and she read the time. She then looked up at me and smiled. As I recall, she spoke something but I was so rapt by her smile, that all I heard was music coming out from her lips. I then realized that she was asking me something, and I came back on Earth. ‘Are you English?’ she asked. To my great pleasure and astonishment, she spoke English and a lovely one too. Her accent was so delicate that I could not understand where she had learned such a correct pronunciation. I then let the sweet signorina go. She headed towards the Piazza, and as she gradually approached the Chapel, I thought that a prayer from her pure heart might really have been helpful to the Pope. I was now still in the train station, waiting for my friend to come back with some news, and explanations for his absence and unusual behaviour. Predicting that it would take a long time, I went to the closest bar and ordered some tea. Surprisingly enough, they served me some peach-ice tea. I tried to communicate to the waiter that I had originally ordered some herb tea. ‘No matter the history, sometimes this country proves to be quite uncivilised’ I thought. I left the ice tea aside, and asked for some coffee which I was served in a remarkably small cup, as an Espresso. I could not quite understand the reason for which there were no decently diluted coffees and traditional tea. I then stood up, paid the bill and left. I wandered around in search of a rustic shop which would sell tea. When I thought I had found one, I entered. Seeing that the place was a very crowded one, I assumed that a decent amount of time would have elapsed before a waiter would have approached me to place my order. I thus comfortably took a seat, and prepared to wait. I searched in my pockets to find a pen with which I could write in my pocket journal. However in my pockets, my hands came across an unexpected object. I sensed it was made out of plastic, and soon took it out, to ascertain with my eyes the hypothesis that I had unconsciously made. Yes … it was the Rubik’s cube, which I had originally brought for Mr. Manni -abiding to his specific request. My memory soon flew back to the days when I first met Manni. I recalled his interesting approach, and by consequence the Rubik’s cube and the formula sheet. ‘I should still have it in my wallet…’ I wondered. I then checked, and it was indeed still there. I took it, and tried to interpret them and apply them on the colourful cube. I don’t know how much time went by. The only thing I remember is that before the waiter could place my order, my sight was obscured by a silhouette standing against the bright sunset coming out from the window. I did not recognize the shadow, but once my pupils had adjusted to the light change, I could discern the man’s facial features. At this moment, the sound of a distant and heavy iron bell was heard. ‘Is that what I think it is?’ I asked Mr. Manni. ‘Oh yes indeed’ he replied stretching his elegant hand forward, in a meaningful gesture implying me to pass him the Cube. He started playing with it. ‘Con molto piacere. Everything started with the radio announcement this early afternoon. The reporter said that priest from the Vatican rumoured to a journalist that the Pope was dead. The newspaper then sent a reporter to ascertain this. The Vatican would not let anyone mention to this matter, and sent the press away. The reporter continues saying that the Bishops’ behaviour has been very secretive in regards to this. ‘As you may recall Clarkson, we then saw black smoke over the Sistine, this corroborated my ideas that there was a mystery going on in the Chapel. This could only possibly mean that the Vatican staff was undergoing a controversial situation. ‘I thus decided to thoroughly examine the Piazza before it would be crowded with the fedeli. I noticed that the carpet perpendicular to the main coloured glass-window had some fresh foot-prints in it. I inspected their position and their pattern. The foot was a relatively small one, and the man (for it was a man shoe) did not exceed the 70 kg. I then turned my attention to the window. The hinges had just been oiled, as the perfect curve of the window opening revealed. ‘However, the person oiling this window was not accustomed in carrying out such a task. The amount of oil used was excessive – a usual mistake of untrained people. If too much oil was used, I supposed that the person would have stained his hands. If such a thing occurred, then the glass was most probably stained with a fatty substance. However the glass was not transparent, thus it was harder to detect the stain. By warming the immediate vicinities, I could now see the distinct outline of the right hand. The hand’s proportions were very specific; the fingers were long and relatively narrow. The palm was not proportional to his long fingers, for it was fairly small. The most interesting detail, however, was the big space between his thumb and his index finger. These hints brought me to the conclusion that the man oiling the window was a distinguished musician. A further detail was that the longest finger –the middle finger – was unnaturally bended towards the outside, as if the finger had been twisted, or recently broken. Comparing his hand dimension to his foot, the hand resulted to be extraordinarily bigger than expected. This thus foreshadowed an exceptional hand development, which is the direct result of assiduous practice on the piano. The piano forte is the instrument which, more than any other instrument causes the musician to have such a remarkable hand development. ‘‘Giovanni Battista Enrico Antonio Maria Montini’’ trifold. ‘The Pontiff never answered; however as the complex traditional ceremony goes, the bishop which had been the closest to the Pope must use the Papal Mirror to detect breath to ascertain his passing away. After a silent rustle, the ceremony went on disregarding this detail. This meant that, just how the bell was not ringing, the mirror was missing. 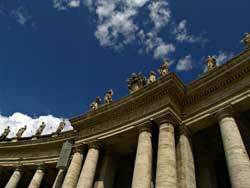 These factors made the members of the Conclave highly uneasy, thus the consequential Vatican secrecy. ‘Did someone outside of the Vatican informed of all this?’ I asked. ‘No Clarkson. Only the Commissariato would be later called by me. The novemdieles could not start without the Basilica Bell toll. As soon as the deacon’s ceremony part was over, I went back to the Basilica, and climbed the flight of stairs up to the attic. I therefore examined the huge bell. Not surprisingly, the bell clapper was gone’. ‘No Clarkson, I fear it was not. The clapper had been meticulously unscrewed. However, a closer examination revealed that in order to reach such a narrow hole inside the bell, the person must have had exceptionally long and slender fingers. Furthermore, it was impossible not to get at least a micro-fracture by undertaking such a task. ‘According to Pythagoras’s theory of ascending harmony. It can be compacted into an algorithm, and it imitates a pattern of natural randomness. These concepts are studied towards the end of counterpoint and harmony courses, attended exclusively by professional musicians. This pattern gives the illusion that the screws just fell, randomly, on the ground’. ‘Manni, you continue astonishing me. What a brilliant deduction!’ I replied in admiration. ‘This is not all Clarkson. Since the person, let’s call him Mister X, had the opportunity to oil the window hinges before he committed the deed, I assumed that Mister X worked regularly at the Basilica. If such a thing occurred, as it did, it meant that our man must have had an alibi for the while he was oiling and planning his peculiar theft. ‘It was flashing out of my waist pocket. When I then fixed my hair, I elegantly approached the church officer. He was immediately attracted and afraid of the pink banknote in my possession. I demanded him, in my most correct Italian accent, where the rehearsing room of the organist was, and introduced myself as being the choir director. He escorted me to the room and unlocked it for me. 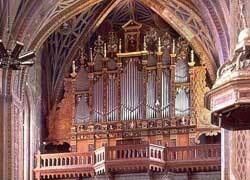 I was now wondering whether Manni had ever played the organ, or studied harmony. I correlated his beautiful hands to his more than deep musical knowledge. ‘So only someone well aware of Papal election traditions could have done this.’ I remarked. ‘His working contract. It expired exactly today; however if he was called in playing for a special event such as the Papal funeral and elections, he would automatically be re-employed full-time for other ten years. Postponing the celebration of a few hours would have saved his career’. ‘So the Papal elections will take place soon?’ I asked. ‘The Vatican had already alerted it when the clapper was not to be found. I gave the police a terse synthesis of my reasoning, and of actual proofs. They brought the man in the Commissariato, and with adequate bureaucratic time the law will take care of him. ‘So Mr. Manni, you’ve solved a tremendously intricate mystery. But just one more detail… How did you know I was here, in this bar? ’ I asked him with utter curiosity. He then laid the cube on the table, which he had arranged while talking. The Rubik’s cube was sitting on the table, solved. During these papal elections of 1978, there was the clamorous case of impossibility for the Conclave to elect a Pope, due to a missing deacon. The Papal elections of 1978 saw Albino Luciani (1912-1979) who was Pope for 33 days. After his funerals, the next Pope, on Monday, Oct. 16 at 11:17 a.m. was elected. The Cardinal pronounced: Annuntio vobis," Cardinal Felici began, "gaudium magnum. Habemus Papam, Ca`rolum Wojtyla. Qui sibi nomen imposuit Ioannem Paulum II. Silvia, ho amato e apprezzato un'altra nuova proposta,sei molteplice, varia e mai noiosa.Soprattutto sei brava! Grazie.